Last year, one of my blogs had 5 visitors, but the number increased dramatically to 63 last week. The growth is huge: 1160%, more than YouTube, Facebook or any Google service. That's the main idea from TechCrunch's iGoogle Google's Homegrown Star Performer This Year, an article which announces us that, according to comScore data, iGoogle is the Google service with the biggest growth: 267.24%. Of course, my blog had a much bigger growth and relative percentages are meaningless. Google's worldwide unique visitors (Nov. 2006 - Nov. 2007). The numbers are in thousands. Source: comScore via TechCrunch. Much more interesting is that Gmail and Google Maps have almost the same number of unique visitors: around 90 million. They're also the most visited Google services hosted at google.com, after Google web search and image search (YouTube, Blogger and orkut aren't included in comScore's study). 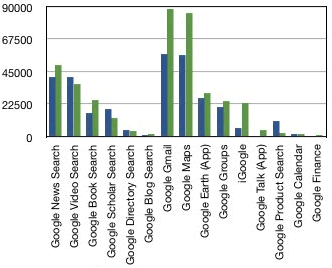 It's also worth noting that Blog Search, Product Search, Google Calendar and Google Finance have negligible traffic and iGoogle has less users than Book Search. Product Search (previously known as Froogle) replaced Google Video on the homepage this month, so the current navigation bar should increase the number of users for the service. Some conclusions: catchy names work better (Froogle had more traffic than Product Search and iGoogle has more traffic than Google Personalized Homepage), Google has yet to figure out how to use Gmail's popularity to increase the usage for other Google apps, Blog Search has the potential to become much more popular if Google integrates it in Google News, Google's navigation is still confusing and frustrating. F1: Two thirds from the number of Reader's feeds have a single subscriber. F2: Google Reader crawled 8 million feeds in September 2007. F3: Google Reader's index size grows with 4% every week. F4: The rate of user growth is the same as the rate of growth for the number of feeds. F5: 70% of the Google Reader traffic comes from Firefox. You may have guessed right.......and its obviously natural. Product Search and Google Calendar is not that useful to the rest of the world (except america). Google Finance, although really very useful site, is totally a waste of time for other countries. On the other hand services and products from Google which are really very useful for the rest of the world, do come on the 'TOP' list. Hope to see Google remove the 'partiality' behaviour. I'm not sure this has to do with international usefulness, considering that Google's traffic is usually 50% from the US and the international sites have different services in the navigation bar. Blogs are still a niche and there aren't too many people interested in searching blogs. Even though Google links to Google Finance from search results (financial OneBox with charts, PlusBox with charts), most people prefer Yahoo Finance and other financial sites probably because Google doesn't offer all the features they need and the site is largely unknown. It's strange that Google Calendar stagnates, but this year the product didn't add any interesting feature that could have put it in the spotlight. The most popular request (sync with Outlook/mobile phones) has been partially addressed this month, but only for Blackberry. Product Search was originally named Froogle and was on the homepage, next to Image Search, Google News and Google Maps. Google decided to change its name and move it in the More dropdown. Now it's back on the homepage with a new name: Shopping (even if it's still formally named Product Search).